A dramatic late penalty was enough to secure DCU a place in the Sigerson Cup final at the expense of city rivals UCD this afternoon. Niall Moyna’s men entered the match high on confidence after beating tournament favourites University Ulster Jordanstown in the opening round, followed by a close quarter-final win over St Mary’s of Belfast. Conditions proved difficult in the opening five minutes, where spectators expecting the sunshine to continue late into the evening were treated sporadic heavy downpours. The rain, however, didn’t bother a slick DCU outfit who fired over in the opening minute thanks to Conor Meredith. Roscommon’s Enda Smith, who featured heavily in the Glasnevin side’s last round victory against St Mary’s, picked up where he left off slotting over two impressive points in the opening ten minutes. Punctuating these points were sloppy UCD wides. One unforced error and two well defended efforts made sure Niall Kelly and Brian Fenton were kept quite during the opening exchanges. On the 10 minute mark Smith took his tally to 1-2 with a brilliantly taken goal just inside the box. A high ball was lofted into the UCD area and the towering Fintan Kelly rose highest to gather the ball for DCU. Quick hands fed the ball to the on-rushing Smith who fired into the top corner leaving Eoin Keogh in the UCD goal no chance. The point of the day, perhaps, came a little over a minute later when Conor Moynagh skipped passed two tackles and, struggling to maintain balance, slotted over the bar from range. John Divily’s side had a chance to reduce the gap but when Martin O’ Cathalain found himself bearing down on goal, the Dubliner could only fist it into the welcoming arms of DCU stopper, Tadgh Lowe. The UCD forward line made had work of their chances and trailed at the break by five points. UCD, who haven’t won the competition in almost 20 years, came out a team transformed in the second half. John Heslin punished DCU for conceding sloppy free kicks and reduced the gap to just a point heading into the closing stages. Despite the goal, the sides were level in the final ten minutes, DCU shooting wide on a number of occasions. A glaring miss from Evin Keane from a simple free ramped up the pressure on Moyna’s charges. With four minutes remaining, Niall Kelly gave UCD the lead for the first time in the game with some patient build-up play and all of a sudden the Glasnevin side looked out of ideas. But in the first minute of additional time, DCU showed their mettle. Another high ball into the UCD area was plucked out of the air by McGraynor and as he dropped his shoulder to speed toward goal, he was impeded by two UCD defenders. A smart stop by Keogh from the resulting penalty rebounded kindly for Smith, who made no mistake second time around bringing the scores to 2-7 to 0-11 in the dying seconds. 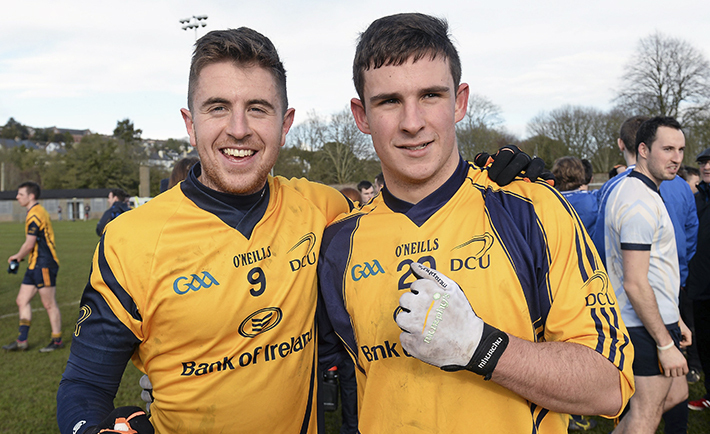 A late free secured DCU’s spot in the final tomorrow afternoon, with the dream of another Sigerson title looking more and more real.